Missouri lawmakers could be considering a far-reaching abortion restriction in the upcoming legislative session. 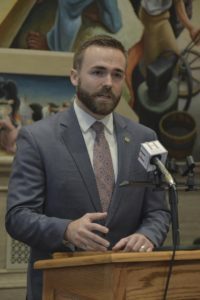 Republican state Representative Nick Schroer of O’Fallon pre-filed a bill this week that would prohibit doctors from performing abortions after a fetal heartbeat is detected. The measure, which allows for exceptions in medical emergencies, would ban most abortions after six weeks. Reproductive rights group contend many women don’t even know they’re pregnant at that time. Schroer’s proposal builds on stricter abortion restrictions enacted by Republican lawmakers and former GOP Governor Eric Greitnens after a special session in 2017. It also comes after a U.S. appeals court this year reversed a lower federal court decision that had blocked Missouri laws requiring doctors to be affiliated with hospitals and abortion clinics to be licensed as outpatient surgery centers. Iowa passed a law this year banning abortions after detection of a fetal heartbeat, but a judge temporarily blocked its enactment until a legal challenge against it by the American Civil Liberties Union of Iowa and Planned Parenthood can be decided. North Dakota and Arkansas also have passed similar laws, only to see them overturned by federal courts. So far, the U.S. Supreme Court has declined to review the lower court decisions. But Republicans in states such as South Carolina have vowed to introduce fetal heartbeat legislation in 2019, possibly feeling emboldened by Supreme Court appointments made by President Trump, who campaigned on a promise to nominate anti-abortion judges. Recently-confirmed Justice Brett Kavanaugh has indicated through his writings that he would allow for more strict regulations on abortion. Kavanaugh wrote a dissenting opinion after the Washington D.C. Circuit Court of Appeals allowed a 17-year-old to end her pregnancy over objections from the Trump administration. Schroer’s measure would require physicians to conduct tests to determine if a fetal heartbeat is present. If one is not detected, an abortion would be allowed within a four day period. If the procedure was not performed within the four-day window, a new fetal heartbeat detection test would be required.